A new executive guest house with conference and training facilities. 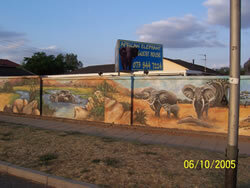 Opposite the Rand Airport in Russel Street, Germiston. Close to West Bank Race Way, Germiston Stadium, Germiston Golf Course, Victoria Lake and Carnival City. Standard or executive rooms, each decorated with a unique wild life theme. Secure under-cover parking. Scrumptious breakfast. Down-to-earth hospitality will make your feel right at home. ** Dinner from set menu = Please request when booking. ** Airport collection or delivery = Please request when booking your accommodation.